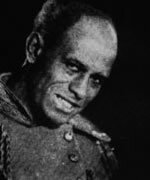 The man who would be hailed as the first "serious" African–American actor got his start on the vaudeville and minstrel circuits. The breadth and depth of Charles Gilpin's acting ability emerged around 1907, when he joined the nation's first legitimate black theater company, the Pekin Stock Company in Chicago. Gilpin refined his craft as a founding member of the first stock company in Harlem, the Anita Bush Players (later renamed the Lafayette Players). In 1919, Gilpin made his Broadway debut playing the role of the preacher and former slave Custis in John Drinkwater's Abraham Lincoln. Though his performance garnered accolades, Gilpin did not create a true sensation until he took the title role in Eugene O'Neill's Pulitzer Prize-winning one-act play, The Emperor Jones. Debuting in 1920 at the Provincetown Theatre in Greenwich Village, the play was one of the first white-authored works to feature an African-American actor in the lead role. The following year, the Drama League voted Gilpin one of 10 people who had contributed most to American theater. The Emperor Jones enjoyed a revival in Europe, where a young Paul Robeson replaced Gilpin as the lead. Some observers contend that O'Neill elbowed Gilpin aside because the actor would not utter certain racial epithets written into the dialogue. Afflicted with alcoholism, Gilpin underwent a steep decline in later years. His career foundered with the loss of his voice in 1929. Gilpin died the next year, on May 6, 1930, at the age of 51. He helped found the acting troupe associated with the Lafayette Theatre. W. E. B. DuBois criticized him for playing roles written for whites. Paul Robeson reprised Gilpin's Emperor Jones role on stage and in film. He was praised for his work in Mayor of Dixie, a musical that was later reborn as Shuffle Along. He became good friends with fellow Lafayette Player, Evelyn Preer.